Nearly all common freshwater aquarium small egg-laying fish are referred to as shoal fish. In biology, any group of fish that stay together for social reasons is shoaling, and if the group is swimming in the same direction in a coordinated manner, they are schooling. A single pair of such species will not be fully happy unless you recreate their natural shoal conditions. In addition to rock ledges and live plants, real shoal fish in nature stay in odd number groups of 3 or 5 or 7 together and are extremely beautiful and interesting to watch. Buying 7 or more beautiful little egg-layer shoal fish can be quite expensive, even prohibitive at today’s prices. But as a result of your breeding efforts, the pleasure and feeling of accomplishment you can derive from a large show tank displaying large shoals of brightly colored species increases tenfold. Even the simplest varieties continue to reveal unknown characteristics after years of care! To gain real pleasure from your fish, you should stick to limited varieties at a time, kept in greater numbers. Beginners find this difficult: but much deeper pleasure comes from detailed study, several species at a time, truly becoming an expert along with the interaction of supporting species like bottom feeders and livebearers. The breeding, rearing and finally the life span behavior, can only be truly experienced when one experiences a species from birth to rebirth than in an aquarium environment. The spectacle of conglomerations of many species thrown together without thought or plan becomes confusing and in many cases can result in a potential long term hobbyist finding his aquarium has become an empty tank in a yard sale. As you meet other aquarists with similar interests, you can concentrate or specialize on one species, while they concentrate on another, then trade 9 or so of the healthiest offspring for your respective show tanks. This can result in hours of discussions covering interesting facts you have learned breeding and rearing your species! Communication with other aquarists is vital to growing your knowledge in the hobby. Aquarium associations are a great place to find friends with similar interests and a great place to find local experts with just the detailed advice you are looking for. You can find advice about breeding a particular species, or what to do when certain problems arise. You will be surprised at how your interest and dedication to learning as much about the hobby is piqued when faced with the friendly computation of networking with people of similar interests. Most shoal fish require a planted aquarium and will withdraw infrequently into the plant growth, but also prefer uncluttered water. Some area in every community tank should be left free of plants and rock outcroppings, either planted sparsely or only with short or small plants. If the fish are disturbed they still have the opportunity of disappearing among the plants. However, you have the maximum opportunity of seeing your shoals of fish in full view if these open areas are in full view of the front of the aquarium. Most species of shoal fish can be kept in well-aged tap water, even those whose breeding water needs are complicated. Most exceptions are imported fish, which must be more carefully handled anyway, and are not recommended as a breeding project and not recommended for community aquariums. Do not expect your fish to breed within the show tank or community aquarium environment. Make no mistake about it, if you have a healthy well-fed aquarium with good water conditions, they will most certainly breed in many cases, but the eggs and young will be quickly devoured. A community tank is not the tank for breeding and rearing young that is a project explained in other blogs. We will discuss the specialized conditions to be provided for each species you will want to breed and rear the young. Breeding within your display tank serves only to disturb the delicate balance you have set up for your viewing pleasure. A number of fish belonging to the same species show off their individual beauty better when they are kept together and swim in leisurely schools. 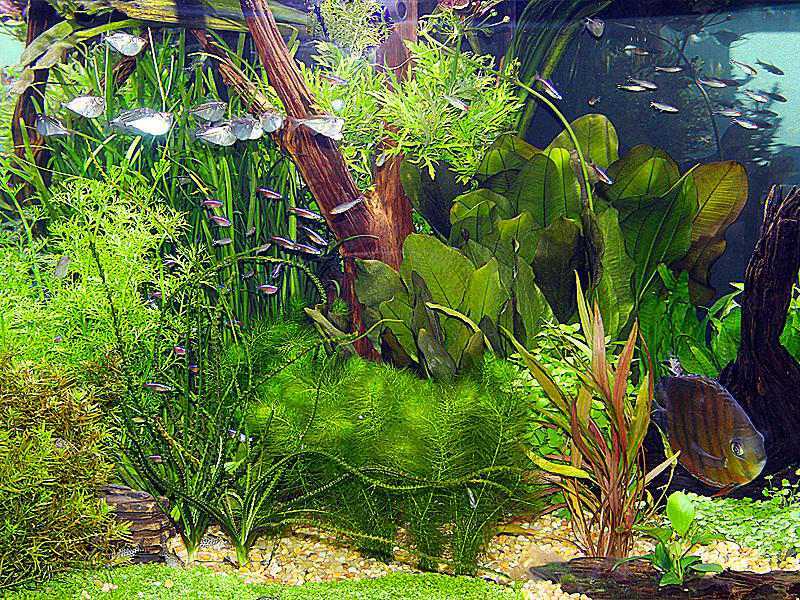 There is much to be said for an aquarium that contains large groups of Neon Tetras or Zebra Danios and a group of Harlequin Rasboras darting in and out of the rocks and plants is truly a sight to behold. There is a unity of color and patterns of movement that is indescribably lovely. Some fanciers insist that such an arrangement is far more artistic than a jumble of fishes thrown together from all over the world. It also enables you to go into the water chemistry of the aquarium and adjust the acidity or alkalinity to adapt it to the groups of fish you chose to house in it. Probably both types of freshwater aquariums will always be popular, along with other specialized freshwater aquariums we will discuss such as African Cichlids. Those fortunate aquarists, who have room for one large “show” aquarium and several breeding and holding tanks, will find the most enjoyment out of this hobby. For more information check out our Twitter, Facebook, and Pinterest and feel free to ask questions by clicking here.